This is the second article of our series, “Biryani Stories”, which looks at the common culinary culture in South Asian countries. 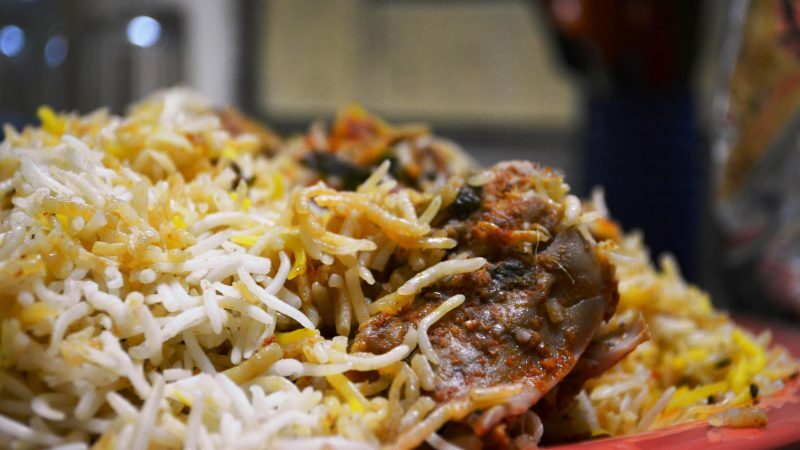 In this installment, we explore the various types of Biryani that exist in India. While a debate rages over whether Biryani, the king of South Asian cuisine, originated in Persia (present-day Iran), history suggests that this mixed rice dish has its origins among the Muslims of the Indian subcontinent — part of the Mughlai cuisine for which India is famous. This does not discount the strong logic behind the claim that Biryani originated in Persia. The word comes from the Persian word “birian”, which means “fried before cooking” — but Iranian Biryani street food no longer contains rice; rather, it has evolved into chunks of meat cooked in an envelope of paper-thin bread. Of course, it is also possible that the food may have traveled with pilgrims from central Asia to the Deccan region in south India. The current Indian subcontinent versions of Biryani were developed from the 15th century to about the 19th century, during the reign of the Mughal Empire. India is a diverse country in terms of culture and culinary flavors. Northern Indian food varieties, for example, have been influenced by the Mughlai cooking techniques like Dum Pukht (slow cooking in a sealed pot) and butter-based curries, while Southern Indian people are fonder of using more vegetables, rice, and seafood. One of the most famous Biryanis in India is Lucknowi Biryani, named after Lucknow, the capital of the north Indian state of Uttar Pradesh. In both flavor and aroma, it is considered one of the best Biryanis: the textures are softer and the spices milder. Hyderabadi Dum Biryani originated as a blend of Mughal and Iranian cuisine during the reign of the Mughal viceroy Asif Jah, who was known as the Nizam of Hyderabad back in the 18th century. His royal cooks would marinate meat with spices overnight and soak it in yogurt before layering it with long-grain, aromatic Basmati rice and placing it in a sealed handi (cooking pot), where it was cooked to perfection in Dum Pukht style. Hyderabad also has some offbeat flavors of Biryiani, especially Doodh Ki Biryani, which is the polar opposite of the spicy Hyderabadi Dum Biryani: because it is flavored with creamy milk, roasted nuts, and minimal spices, it tastes rather mild. Towards the south of India, the Biryani recipes start to vary wildly, incorporating ingredients like vegetables and seafood. Take the example of Bhatkali Biryani from Bhatkal, a tiny coastal town in Karnataka state. For this dish, the meat, the spices, and the rice are all cooked separately without using oil and ghee, and mixed only seconds before serving. Further south in Mangalore, a coastal town in Karnataka, there are seafood varieties of Biriyani. In this Pukki Biryani, where half-cooked fish is layered with rice in a sealed handi and slow-cooked, spices like fennel and coriander are common, as is the use of rice varieties other than the traditional long-grained Basmati. The Ambur Biryani from the Arcot region of Tamil Nadu is basically Pukki Biriyani (rice cooked separately) with a distinctive feature: it uses a short-grained Seeraga Samba rice. Further southeast, in Kerala, the Thalassery Biryani uses Jeerakasala rice — a short-grained local variant, which is cooked separately from the meat, then combined with the famous spices of Kerala and garnishes like fried onions, cashews, and raisin to blend the flavors. The Kozhikode Biryani (Calicut Biryani) uses Khyma Rice and is tempered with several Kerala spices that give it its signature spicy taste. The Memoni trading community of Sindh-Gujarat in northeastern India has Memoni Biryiani, made with lamb, yogurt, fried onions and potatoes, and fewer tomatoes compared to the famous Pakistani Sindhi Biryani. The distinguishing factor in the western Indian Bohri Biryani cooked in Dum style is the moist, smoked meat. The Kolkata (Calcutta) Biryani from West Bengal is similar to the Lucknowi Biryani, but more subtle in taste, with fewer spices and the addition of potato and egg. In India’s northeast, the Kampuri Biryani is a simple, colorful dish prevalent in the Muslim town of Kampur in Assam. First, the chicken is cooked separately with peas, carrots, beans, potatoes, and bell peppers, and spiced with mild cardamom and nutmeg. It is then mixed with Basmati rice and cooked over a slow fire. The traditional Mughal Biryani was a meat dish, which strictly vegetarian Hindu officers of the court could not have. For them, there was Tehari or Tehri dish, in which the meat was substituted with potatoes. This vegetarian version of the cult dish remains a popular street food in Kashmir and Uttar Pradesh. Mutanjan Biryani, which uses almost equal amounts of mutton, rice, and sugar, is very popular in Kashmir and Lucknow. It is blended with cream, spices, saffron, screwpine water, and rose water. The debate may go on, but no one will ever turn down a Biryiani treat.